The International Federation of Reproduction Rights Organisations (IFRRO) is an international, independent, not-for-profit organisation established on the basis of the fundamental international copyright principles embodied in the Berne and Universal Copyright Conventions representing the interests of collective management organisations, authors and publishers in the field of text and image based works. These organisations are known as Reproduction Rights Organisations (RROs) which administer reproduction and other relevant rights, including certain digital rights, on behalf of both publishers and authors including visual artists. JAC became an Associate RRO member in 2002 then also a RRO Member of IFRRO. We have bilateral agreements with 32 international organisations as of October 2017 and rank in the top 1/4 of all 60 RRO members with the amount of royalties collected for FY 2015 which is over 11 million Euros. JAC has reciprocal agreements with a number of RROs in international territories. Through these agreements, JAC members are represented in oversea countries by foreign RROs in the same way as those societies represent the interests of their own members. JAC has bilateral agreements with 33 international oragnisations as of June 2018 (20 Type A and 13 Type B agreements). There are 2 types of Bilateral Agreement between RRO Members of IFRRO. Any distribution of remuneration by one RRO to another RRO should be made not less than once per year. JAC provides a range of copyright licenses that allow users to copy from more than 4,700 titles of works that belong to our rightsholders such as academic journals, periodicals, books, research articles, references, handbooks, technical reports, annual reports, and reports that are published by universities and research institutions. We represent the rights of our rightsholders on academic related works including mechanical material engineering (1,371 titles), environmental, biological, agricultural, fishery and livestock works (851 titles) and medical science (700 titles). Through bilateral agreements with international organisations, international affiliates will be able to license the use of Japanese works and collect license fee for Japanese contents used in overseas countries, also JAC members are represented in overseas countries by foreign RROs in the same way as those societies represent the interests of their own members. JAC has signed contracts with more than 300 companies. 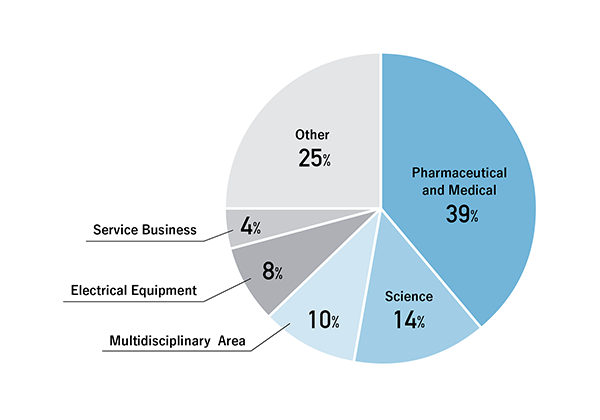 The breakdown by sector is pharmaceutical and medical (39%), science (14%) and multidisciplinary area (10%) and others. We provide license for Medical Representative (MR) from pharmaceutical companies (MR-AAS). Pharmaceutical companies have special characteristic of sales people employed by them who provide doctors their new products/medicines along with evidential medical documents and detailed information about new products/medicines to help their patients in Japan. It is essential for them to have assured and smooth licensing for necessary documents to perform their business activities while meeting their compliance requirements. JAC provides suitable business licenses which meet the need for pharmaceutical companies that require the permissions from copyright owners to make external distribution of copies of documents. JAC’s business license for MR enables pharmaceutical companies to provide to external requests for information with having proper permissions to make external distribution of copies of copyrighted works, resulting in significant advantages for the business. Most of works used in Japan are from overseas and its amount of royalties collected is over 3 million Euros which also means to protect the rights of copyright owners in overseas countries where JAC has bilateral agreements with. Permissions for making copies from foreign works that RROs represent in international territories are made through these licensing services.